Home › 2a) Swiss Macro › 2013 Posts on Swiss Macro › T. Jordan: Strong Swiss franc and large current account surplus – a contradiction? T. Jordan: Strong Swiss franc and large current account surplus – a contradiction? For almost 18 months now, the Swiss SNB(SNB) has been enforcing the minimum rate of CHF 1.20 per euro with utmost determination. In summer 2011, the appreciation of the franc had assumed such proportions that we had to act in order to fulfill our statutory mandate. SNB monetary policy is focused on ensuring price stability while taking due account of the economic situation. We extended the first money market liquidity at a historically unprecedented scale. Since this measure did not achieve the desired sustainable stabilization on the foreign exchange market, we finally fixed the minimum rate on 6 September. Thus the SNB met the monetary tightening due to the massive strength of the franc which was menacing the Swiss economy. 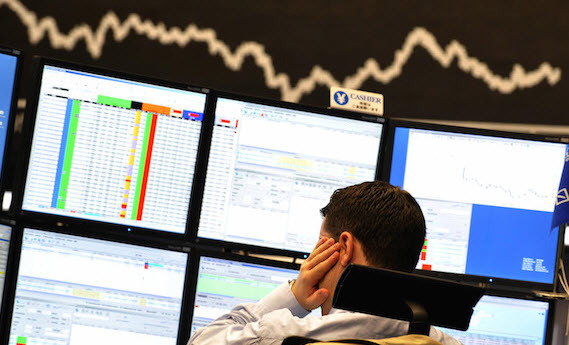 International developments unsettled financial markets and made the franc a safe haven. With interest rates at almost zero, we announced the introduction of the minimum rate for the foreign exchange market and thus put up a clear barrier in a situation in which the possibilities of conventional monetary policy had been exhausted. Thereby, like other central banks, the SNB is becoming active in the area of unconventional monetary policy. The necessity of the minimum exchange rate is widely recognized at home and abroad. In particular, the other central banks and the International Monetary Fund (IMF) understand the specific situation for Switzerland. They acknowledge that, given the exceptional circumstances, a minimum exchange rate is required. There is a common understanding of this view, not least because we have clearly set out and explained our motivation for the introduction of the minimum exchange rate from the very beginning. We have also fixed the minimum exchange rate at a level at which the franc is still highly valued. The significant exchange rate movements of some currencies have recently given rise to discussions on various occasions. Thus, the influencing of exchange rates by central banks has been criticized, either directly through foreign exchange purchases or indirectly through additional monetary easing measures, such as securities purchases. Ultimately – so the critics argue – the relevant central banks operate a “beggar thy neighbor” policy: They were only concerned about supporting their own economies by means of a weakening of the currency at the expense of other countries. Sometimes it is feared that a devaluation competition among countries could emerge. Mostly Japan, the UK, the USA and occasionally Switzerland, are mentioned in this context. Discussions on the permissibility or need to influence the domestic currency will also find a fertile ground in the markedly increased global imbalances after the turn of the millennium. 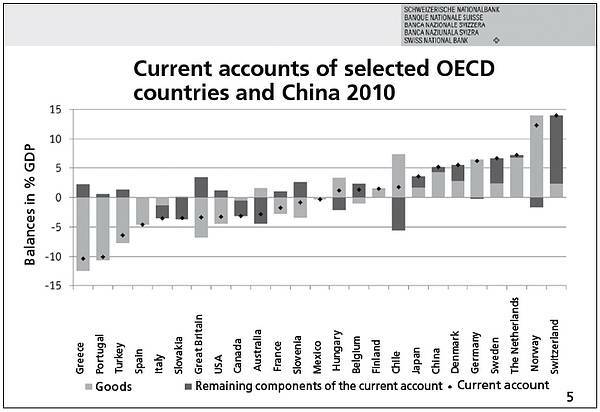 The deficits in the current account of many countries have increased significantly. In return surpluses in other countries increased, as can be seen in Figure 2 [Fig 1 corresponds to the title of the speech]. These global imbalances might lead to instability and jeopardize global economic growth. 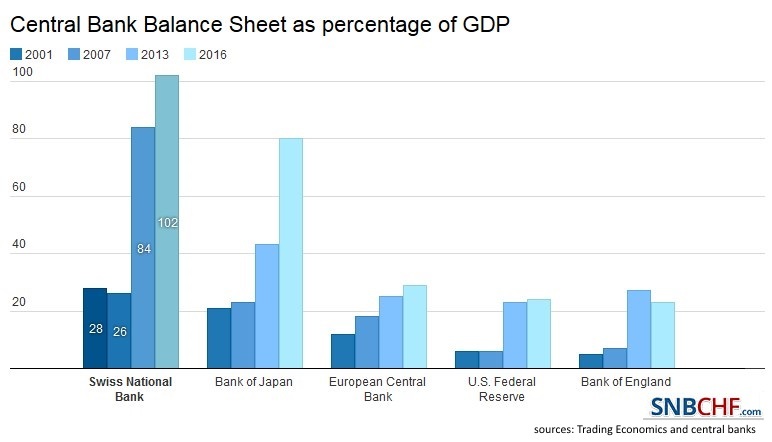 Given this development there is an intense debate whether surplus countries are partly responsible for these imbalances, not least because of a potentially weak currency. China, Japan and Germany as surplus countries are primarily in the focus of this discussion. Sometimes in this context, however, reference is made to the current account surplus in Switzerland. In 2011, the current account surplus was 8.4% of the gross domestic product (GDP). This large surplus, that’s how the argument runs, is a sure sign that the franc is not strong, but too weak. 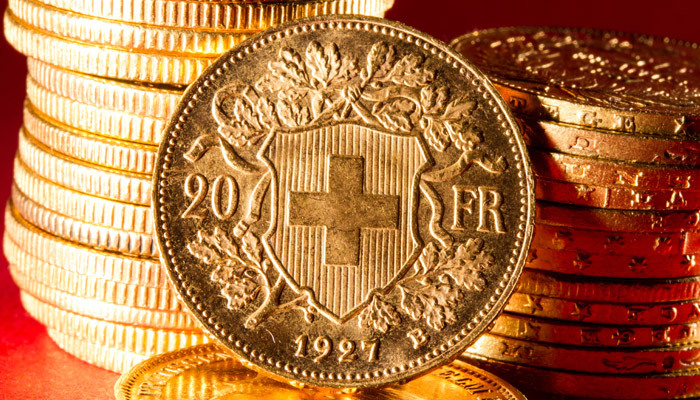 The SNB should therefore abolish the minimum exchange rate and allow a further appreciation of the Swiss franc. As a result, the surplus in the current account would recede. This would contribute to reducing global imbalances. This view is based on a lack of knowledge about the situation in Switzerland and therefore leads to a sometimes misguided discussion about our monetary policy. Ladies and gentlemen, today I would like to show therefore, that the SNB does not engage in “Beggar thy neighbour” policy and that there is no contradiction between the overvalued franc and the substantial current account surplus in Switzerland. In order to do so, I will call to mind the first of the main components of a current account. I will then address the question, what do surplus and deficit mean for the current account and under which circumstances can this be viewed as actually problematic from a global perspective. I will dedicate most of my remarks to the specific causes of the high current account surplus in Switzerland. These are hardly influenced by the exchange rate, but rather by the international development. Accordingly, it is not effective to reduce the Swiss surplus and global imbalances via an appreciation of the Swiss franc. As a small, open economy with substantial foreign direct investment our country makes quite a considerable contribution to a balanced global economic growth. Finally, I will argue that the monetary policy of the SNB is not aligned with the current account. Rather, it was the concern about price stability and overall economic development that led us to take action against the massive overvaluation of the Swiss franc in the summer of 2011. Let me now begin with some general remarks on the current account. What is the current account after all? Let us consider Figure 3. The current account initially records the exports and imports of a country’s goods. If we were to stop our considerations at this point, we would be dealing with the balance of trade. The current account, however, includes four other major components. It also considers the exports and imports of services. Moreover, it accounts for the income on investments by residents abroad or foreigners in our country, the so-called capital income. Another position of the current account is the income of nationals abroad and foreigners in our country. Essentially, these are the incomes of commuters. Finally, it includes the current transfers, i.e. payments from home to foreign countries or vice versa, for which there is no direct compensation. This includes, for example, the development aid or transfer payments from foreign workers in Switzerland to their families back home. If the current account shows a surplus, this means the following: The added income generated by the goods and services export plus the capital and labor income from abroad and current transfers from abroad are higher than the corresponding expenditure. A current account surplus means for a country nothing but that it spends more than it earns in transactions with other countries. A portion of the income of this country is not spent on consumption and investment at home. The savings surplus is invested abroad, so the country’s balance abroad is rising. Is the fact that there are countries with current account surpluses and those with deficits a fundamental problem at all? In fact, there are no objections to a country that rather saves and invests these savings surplus abroad, i.e. exports capital, neither to another country that consumes and invests more than it saves and thus imports capital. There is no – derived from economic theory – optimal current account balance. Basically each account surplus is optimal as long as it has developed without distorting restrictions of goods and capital. The current account balance ultimately reflects the private savings and investment decisions and the state’s fiscal policy. A look at the economic history shows that large current account deficits, however, are often a leading indicator of financial crises. This is due to the fact that such deficits must be financed. This financing may sometimes end abruptly. Difficulties may arise in particular when a deficit country consumes the imported capital or invests in unprofitable projects. The problem will increase, if not a few, but many countries have increasingly large deficits. Such global imbalances do not constitute a basis for sustainable growth of the world economy. Against this background, the deficit countries are usually warned not to allow their loss to escalate, respectively to reduce it. The investors might otherwise lose confidence and may not be willing to fund the deficit countries’ spending with their savings surplus. If failures are diagnosed in surplus countries, roughly speaking there are two approaches in the foreground to possibly reduce a surplus in the current account. The first approach assumes that domestic demand was hampered by home-made obstacles, and therefore it was too weak. Therefore, measures should be implemented that strengthen domestic demand. This corresponds to the so-called absorption approach that aims to increase spending on consumption and investment at home. As an obstacle to a higher absorption in many cases, structural problems are diagnosed. As an example of such a structural problem China’s social security system is often referred to. The idea is that if China improved this system, Chinese households would save less and consume more.2 This would increase the imports, and the surplus in the current account would be lower. The second approach, on the other hand, builds on the exchange rate. According to this line of reasoning, the negative development is that the currency of a surplus country was artificially kept at a low level. The currency would have to revalue. This would make foreign goods cheaper and thus increase the domestic purchasing power. Simultaneously the prices of the locally produced goods would increase. According to this interpretation, the country with a stronger currency would import more and export less. The current account surplus would decrease, and in the mirror image, deficits in the deficit countries would be reduced as well. Switzerland is not in the center of this international debate about a need for adjustments by surplus countries. Mostly, however, it is also suggested to our country that the franc should – despite the already massive appreciation in recent years – continue to appreciate, so that the current account surplus would decrease. This would be Switzerland’s contribution to reducing global imbalances. Let me explain now why this argument does not meet the situation in our country. 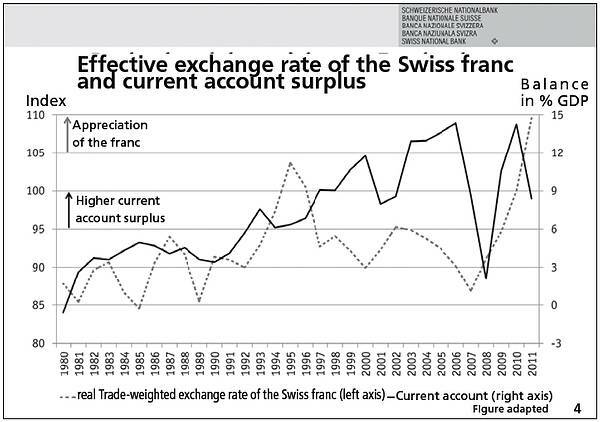 Consider Figure 4, which shows the current account surplus and the real trade-weighted exchange rate of the Swiss franc; the real exchange rate though,that measures the performance of the Swiss franc against the currencies of Switzerland’s major trading partners. As you can see, the current account surplus does not decrease automatically in the case of a real appreciation of the Swiss franc. Neither does the surplus readily increase when the Swiss franc is devaluated. The theory that a stronger real Swiss franc automatically leads to a lower current account surplus, does not empirically apply for Switzerland. If in the case of Switzerland the trade balance does not determine the current account, then what are the factors that cause this excess? Figure 6 illustrates that the high current account surplus is mainly due to two components. It is the investment income and the services, or briefly put the services. The figure shows the balances or net income of these components. In other words, the revenues that flow abroad have been deduced from the incomes which flow from abroad to Switzerland – in this case for the invested capital and provided services. A positive balance means that the revenue is greater than the cost. I will explain later in detail that the balances of these two components are hardly affected by the exchange rate. 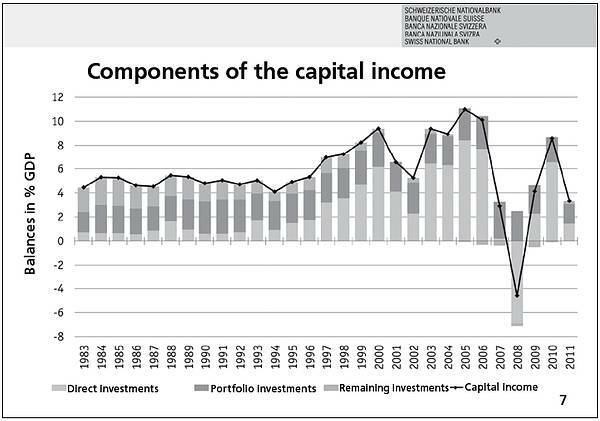 As shown in Figure 7, the net income from portfolio investment relative to GDP has remained relatively stable year by year.10 The change in net capital income and thus the current account surplus is also mainly due to the income from direct investment. This component has significantly increased in the second half of the 1990s and contributed decisively to the rise of the current account surplus during that time. 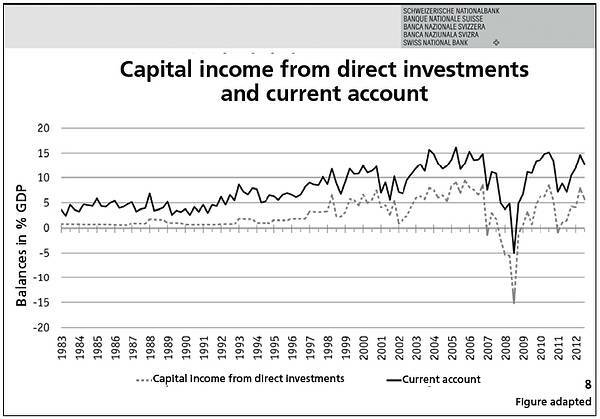 The impact of this investment income on the current account balance is clearly visible in Figure 7. Let us now look at the revenue from services. There are two “driving forces” for the current account surplus: for one thing the cross-border financial services, for another thing the transit trade. I do not have to say much about the revenues from cross-border financial services. The great importance of the financial sector for our country is known. The revenues that banks and insurance companies from Switzerland achieve in business with foreign customers flow into the current account. Especially the banks’ financial services come into play in this cross-border trade. As you can see from Figure 8, the net income has been showing trends of decline since its high in 2007. 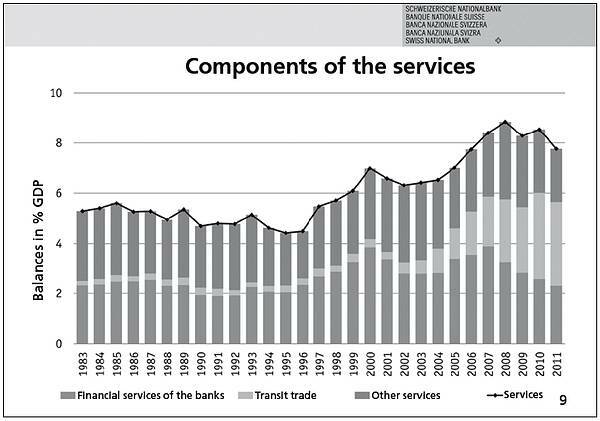 In return, the income generated by transit trade has increased significantly in the past decade and since 2010 it is higher than that of the banks’ financial services. Over the last five years, it has accounted for almost a third of the current account surplus. What is meant by transit trade? A domestic company buys and sells goods abroad, without the traded goods being altered.13 These products never cross the borders of the country in which the company is headquartered.14 Let me give you an example: a trading company based in Switzerland buys Zambian copper and sells it to China. The copper is directly shipped to China.15 The merchandise will never touch Swiss soil and is not registered in the balance of trade. Instead, the item “transit trade” will account for the margin from the transaction as revenue in the current account. Since the margin is usually positive, a current account surplus will result for Switzerland. The main players in this field are commodity traders, chemical and pharmaceutical companies. Measured by sales revenue in Switzerland, most of the transit trade is operated with raw materials. Therefore, transit trade and commodity trading are often used as synonyms. The commodity trading is traditionally done in US dollars, and the Swiss franc does not matter. Transit trade in Switzerland is principally a traditional branch of trade. Its origins go far back into the history of famous Swiss trading houses. However, it has experienced a considerable boost, especially since the turn of the millennium. Capital income, incomes from cross-border financial services of banks and from transit trade therefore contribute significantly to the high current account surplus. But there is a further element, which due to its magnitude must unfortunately not be neglected here; namely statistical distortions. The Swiss current account surplus is statistically overrated. These distortions are associated with the internationally accepted method of calculating the income from direct investment on the one hand and the returns on portfolio investments on the other. The income from direct investment, the total profits of the subsidiaries are recorded – hence not only the dividends that were distributed. With portfolio investment in shares, however, only the dividends are taken into account. This accounting method results to an overestimation in Switzerland. Why is this so? In addition to these accounting issues, it is also possible that the shopping tourism in recent years has not been fully reflected in the current account. Ladies and gentlemen, criticizing Switzerland because of the current account surplus is therefore not justified. The high Swiss current account surplus is caused by specific factors, namely high net foreign assets, the special role of our country as an international financial center and the merchanting. In addition, the excess is overrated statistically. The income surplus in Switzerland is thus not due to a faulty development that should be corrected actively. In particular, the current account balance is not due to a weak Swiss franc. Because of these factors, which are responsible for the high current account surplus in Switzerland, the real trade-weighted exchange rate of the Swiss franc plays no decisive role. Why is this so? The investment income on external assets is directly determined by the development abroad, mainly by the income from direct investment abroad. The same applies for the transit trade. The income from transit trade is influenced by the external demand and the associated commodity prices – denominated in US dollars. Finally, the banks’ earnings from cross-border services depend to a large extent on the development of managed assets – mainly denominated in foreign currency – and thus of the international financial markets. The exchange rate of the Swiss franc has an impact only on the conversion of revenues into foreign currencies. The income on investments from merchanting and from the cross-border financial services would only be smaller after conversion into Swiss francs in case of an appreciation. The revenues in foreign currency would however not go back and the current account surplus would not disappear. The large surplus in the current account in Switzerland is thus not due to a weak or a too weak Swiss franc. An exchange rate appreciation does not necessarily lead to a reduction of surpluses, not even in the trade balance in Switzerland – as the past has repeatedly shown. Let us carry the logic too far that a “real” appreciation would make the surplus disappear and let us assume the Swiss franc would extremely appreciate: such a strong exchange rate would ruin the Swiss economy, massively affect domestic production and acutely endanger price stability. This shock could also cause the import demand for foreign consumer goods, investment and advance goods to collapse. This would also have a negative impact on the majority of foreign countries. Let me therefore emphasize again at this point that there is basically no valid economic reasoning for a balanced current account. This finding is particularly true for Switzerland: The high surplus of our country is not due to mistakes, but based on factors that cannot be influenced by the exchange rate. Considering the current account surplus from the savings and investment perspective, it means nothing else but that a country saves more than it invests. The savings surplus is invested abroad. With an aging population, it is economically rational to save more than invest domestically. From the perspective of demography it is expected that with the progressive aging of society the savings surplus will gradually decline once more. 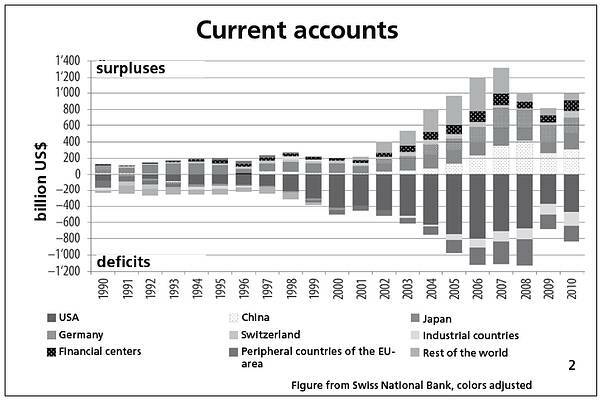 The high current account surplus is not a suitable measure to assess Switzerland’s contribution to global imbalances. Rather, it is an indicator of the development abroad. This can be illustrated well in the following context: If the development abroad is successful, this income will be generated in foreign direct investments, which are recorded in the current account. Economic growth and employment in the target country are directly linked to these direct investments of Switzerland. Busy Swiss direct investors employed a total of 3.8 million people, 78% of them in overseas subsidiaries. In comparison, employment in Switzerland is about 4.1 million people.19 This may be described as a contribution to a balanced global economic growth. Moreover, Switzerland is indeed a small economy, but a very open one. This is reflected not only in the export share of GDP of 50% but the import share is at a high rate of 40%, as well. Relative to its size our economy imports above average. Ladies and gentlemen, the high current account balance is therefore neither mainly determined by the exchange rate of the Swiss franc nor by the Swiss economy. Even though the Swiss franc exchange rate is not a determining factor for the development of the current account, strong real exchange rate movements due to Switzerland’s openness can have a major impact on domestic production and price stability. Swiss economy can, however, deal with a gradual, long-term appreciation of the real exchange rate. 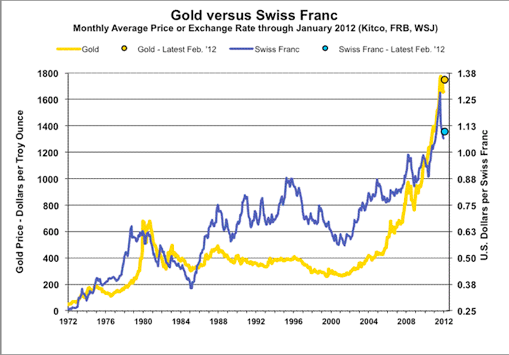 But massive and abrupt changes in the exchange rate have a significant impact on prices and production in Switzerland. They can lead to deflation and recession. 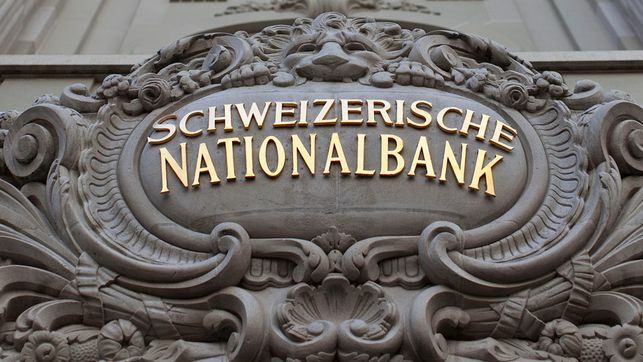 What does all this mean for the monetary policy of the Swiss National Bank? It means that we do not orient our monetary policy towards the current account balance. The current account balance is not an indicator for production capacity utilization in Switzerland; in particular, it is also not an indicator of price stability. The SNB therefore has no aim for the current account balance. Our monetary policy is aimed at maintaining price stability in Switzerland. 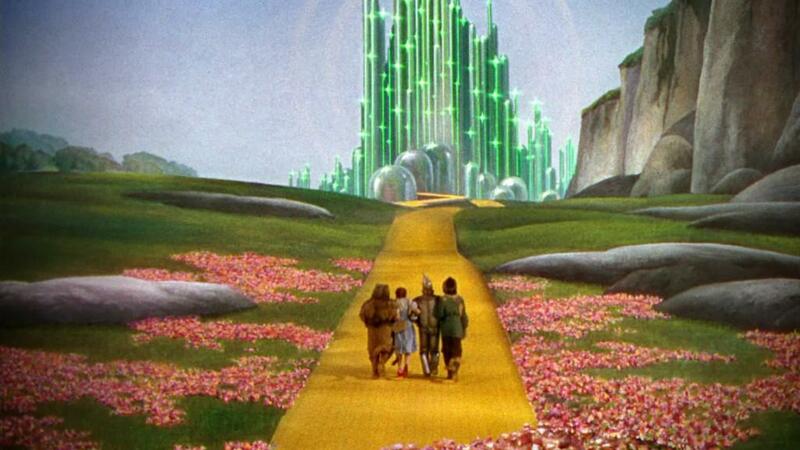 We thus take the economic development into account. To fulfill this mandate, the SNB must ensure appropriate monetary conditions. In the summer of 2011, the Swiss franc rapidly and massively appreciated as a result of international developments. The appreciation reflected the fear of investors and the function of the Swiss franc as a safe haven but it did not reflect fundamental factors. In early August, the real trade-weighted exchange rate of the Swiss franc was about 40% above its long-term average. As you may recall, temporarily the euro cost just 1 Swiss franc and the dollar was at 0.70 Swiss francs. This enormous appreciation acutely threatened Swiss economy and risked a deflationary development. It has also reduced the level of Swiss consumer prices significantly. 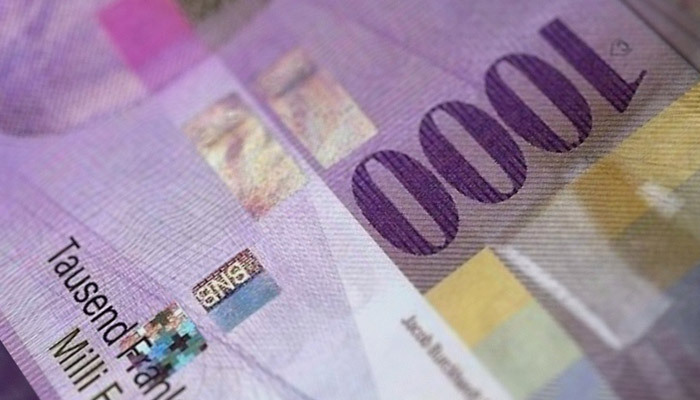 The SNB had to act in order to maintain price stability in Switzerland. With the introduction of the minimum rate of the Swiss franc against the euro, we have prevented serious damage for the Swiss economy caused by a massive and potentially prolonged overvaluation of the Swiss franc. Moreover, in a critical situation the economy has obtained predictability. 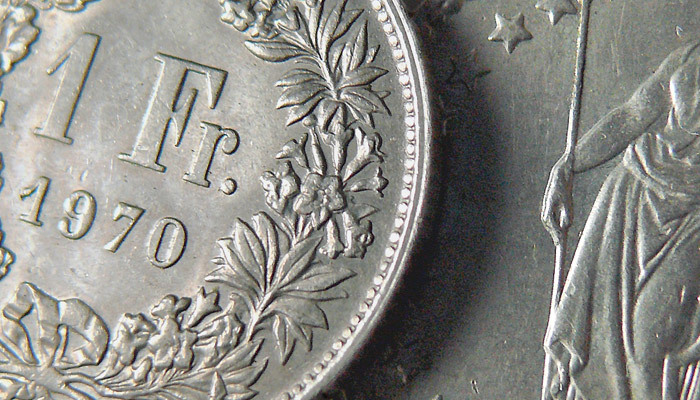 The SNB set the minimum price at a level at which the Swiss franc is still highly valued. The introduction of a minimum price did not create a competitive advantage and operated no “beggar thy neighbour” policy. On the contrary: the competitive disadvantage resulting from market failures at the foreign exchange market in summer 2011 was reduced only partially. The SNB had a stabilizing effect and provided the foreign exchange market with a guardrail after a period of extraordinary volatility. 1 O. Blanchard, G.M. Milesi-Ferretti (2009), Global Imbalances: In Midstream?, IMF Staff, Position Note. 2 This is not necessarily the case, as the example of Switzerland with its extended mandatory pension scheme shows. 3 Against the euro area, the largest trading partner of Switzerland, our country has traditionally made a trade deficit, which has remained so in recent time. 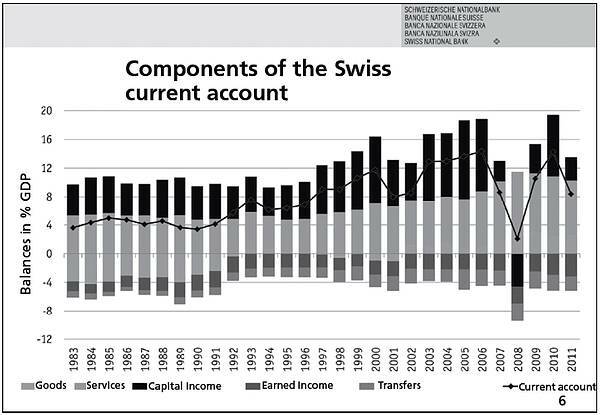 4 Another part of the explanation can be seen from Figure 5, which shows the individual components of the Swiss current account over the past two decades. During this period one can observe a slight upward trend in merchandise trade balance. At the same time, the Swiss franc has shown a real appreciation, as can be seen in Figure 4. So it is not necessarily the case that in case of an appreciation the trade surplus is declining. 5 Only in 1980 the current account of Switzerland showed a deficit. 6 Even then the savings surplus was based on net revenues from assets abroad and on net revenues from services with foreigners. 7 T. Schlup, “Zahlungsbilanz”, in: “Historisches Lexikon der Schweiz”, electronic edition (e-HLS). 8 In portfolio investment and direct investment Switzerland shows large net foreign assets, which account for 84% of the Swiss net assets. In some years, the increase in net foreign assets, caused by the current account surpluses, was however variously ruined by currency-related losses on the assets held abroad. 9 Since 2011, the foreign exchange reserves are another important component of net assets. 10 These revenues include inter alia the capital income of pension funds on their foreign assets and transactions carried out by households in foreign portfolio investments. Particularly the foreign investments placed under the occupational pension funds virtually face no foreign obligations. The net foreign assets of the pension funds and private household yields relatively constant returns each year, contributing to that net income in the portfolio investment and thus to a surplus in the current account. 11 These companies are then considered domestic companies, because their capital is not in the hands of direct investors, but in those of portfolio investors – even if they are mainly foreign portfolio investors. They have a positive effect on the current account, in contrast to the foreign-controlled holding companies of foreign corporations, whose revenues and expenditures are balanced in the long term. 12 Since the financial crisis this net income, however, has become volatile. In 2007, only a small increase was recorded, and in 2008 even a sharp decrease resulted. This decline was due to losses at subsidiaries of financial institutions during the financial crisis. As a result, the current account surplus fell temporarily to just 2% of GDP. 13 In contrast to a broker the transit dealer remains owner of the goods during the time from the purchase to the sale. 14 “Transithandel in der Schweiz”, Swiss National Bank, “Zahlungsbilanz, 2011” 34–41st-E. Beusch, B. Döbeli, A. Fischer, P. Yesin (2013), Merchanting and Current Account Balance, mimeo, Swiss National Bank. 15 Here, the trading company will organize the control of goods and the financing of the purchase price by bank credit. Since the seller in Zambia wants to be paid immediately and not wait until the customers in China pay for the goods. 16 A feature of these companies is their high geographic mobility. 17 According to international standards, share ownership is recorded as portfolio investment, as long as each investor holds less than 10% of the capital. 19 According to employment statistics of the Federal Statistical Office, recorded methodologically in the same way as the number of staff abroad.